Albania is a country with exceptionally rugged terrain, a wide range of altitudes (0-2,694 m a.s.l. ), and varied climatic conditions; the result is a great diversity of habitats. The mountain forests occur here naturally from the lowest altitudes up to approximately 2,100 m a.s.l. The forests above 2,100 m change from thermophilous oak, chestnut, and walnut forests (Quercus sp., Castanea sativa, Juglans regia) to forests of Pinus nigra and mixed beech-pine forests in the extreme habitats. At the middle and higher altitudes, pine forests (Pinus peuce, P. heldreichii) form the borders of the forest. In some places, rare isolated spruce (Picea abies) stands might be found; this is the western limit to its natural range. 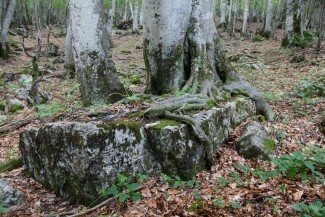 According to data from the early 1930s, primary forests (mainly beech) in Albania were still large, but specific numbers are unavailable.1, 2 However, most of these original stands have been transformed into production cultures, and many were eliminated during the Communist dictatorship. This destructive process has continued even after the fall of the regime, and problems with illegal logging have persisted until today.3 Since the beginning of the Communist Era until 2012, the forest areas have decreased by 328,000 ha (25 % of the country's land area) to the most recent estimate of 1,000,000 ha (36 % of land area), and the trend continues to decline.4, 5 Since 2016, a moratorium on tree felling has been in force in Albania, but currently, there are large problems with illegal large-scale logging in protected areas. The vast majority of Albanian forests have been economically exploited and primary forests cover only a small part of the overall forest area. Forest regions at lower altitudes were almost completely destroyed (with the exception of only the most inaccessible places) and all the well-known examples of primary forests that were preserved are found only at higher altitudes. No estimates of the overall primary forest area of the country exist, but probably few primary forests have been preserved. Two famous localities have been included in the network of "The old and century-old Beech forests of the Carpathians and other regions of Europe". Those well-known localities are Lumi i Gashit (1,261 ha) of Bjeshket e Namuna Mountains (Prokletije) and Rajce (2,129 hectares) in Shebenik-Jablanica National Park.6 Lumi i Gashit has been under a strict conservation regime since 1996 (IUCN category 1). During fieldwork in 2016, we identified another primary forest of several hundred hectares in the neighbouring valley Curraj i Epperm. 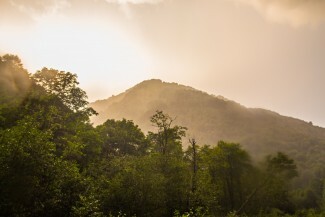 There are several potential primary forests around the area often referred to as the “Iron Curtain“ in northern Albania, a region that formerly depopulated. However, a more detailed field survey is needed to identify those potential primary forests. Our research areas are located in beech and mixed forests in two locations in the Prokletije Mountains.